MEMORIA 16GB (4X4GB) KINGSTON, PC/DESKTOP, DDR4, 2400MHZ, PC4-19200, NO-ECC. HYPERX FURIX BLACK. Fountain Valley, CA – – HyperX®, la división de productos de alto rendimiento de Kingston® Technology Company, Inc., HyperX FURY DDR4 memory. HyperX FURY DDR4 is the first product line to offer automatic overclocking via plug-and-play functionality for the next generation of high-end desktops featuring the Intel® X99 chipset and Haswell-E processors. 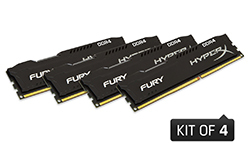 HyperX FURY DDR4 is available in 2133MHz, 2400MHz and 2666MHz frequencies, and in various kits configurations from 8GB to 64GB.